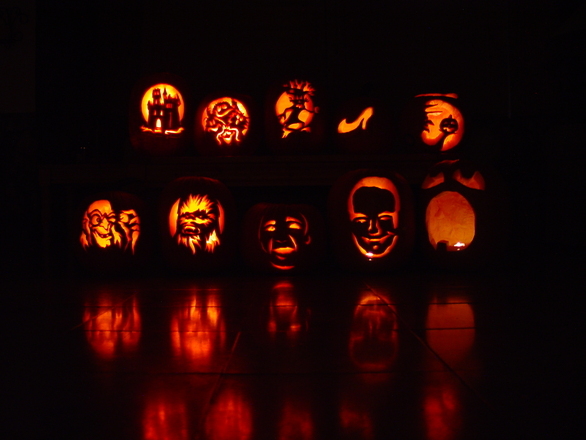 Pumpkin carving is one of the most notable parts of Halloween tradition. Since Halloween has evolved into an entirely secular holiday,filled primarily with thrills, chills, and bumps in the night and celebrated with scary stories and candy, most people don’t recognize the origins of the pumpkin carving tradition. In reality, the habit of carving pumpkins and placing a light in them was intended to ward against evil spirits and welcome the spirits of deceased loved ones into the home. Over the years, however, this tradition has evolved from a spiritual one into a fun activity for many parents to enjoy with their children during the Halloween season. For families with only basic carving skills, Halloween pumpkins don’t have to be fancy. They can construct funny, scary, or smiling faces with a variety of simple shapes that are easy to cut out with a knife. Many parents allow young children to design the face that will be carved on the pumpkin and trace it in pencil or marker, then carve the pumpkin for them. Older children may be permitted to try out their pumpkin carving skills for themselves. This tradition allows children to express their creativity and their personality through a time-honored tradition that will be displayed on the nights leading up to Halloween. A notch is carved out of the pumpkin’s “lid” to allow adequate air flow, and at night, a lit candle is placed inside to light the way and display the child’s effort for visitors throughout the Halloween season. For some people, pumpkins aren’t just a bit of disposable artwork that will decorate the front steps throughout the Halloween season. These artists take pumpkin carving to elaborate new levels. They might use drills and other specialty tools to achieve the desired effect. Some talented artisans can even carve through only the top layer of pumpkin skin, leaving the flesh beneath to create an eerie glow effect. 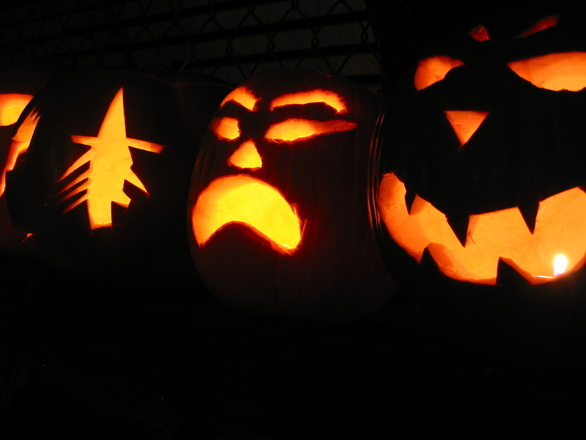 Artistic pumpkins aren’t necessarily carved with faces. In fact, they can be carved with anything the artist can imagine, decorating the entire pumpkin with skill and creativity. In some cases, the pumpkin is only used as part of the display: a backdrop designed to create a Cinderella’s carriage effect, for example, or display that includes multiple different pumpkins. Families with young children may be wary of putting knives into the hands of their little ones. Others may dislike the idea of hours spent bending over a pumpkin in the attempt to properly remove every trace of pumpkin flesh from the design. For these individuals, there are alternatives! Many grocery stores and Halloween shops now sell pumpkin decorating kits. They have plastic eyes, ears, noses, and mouths that can be stuck straight in the pumpkin. A few pounds with a palm or a mallet, and the pumpkin is ready to sit on the stoop. This is particularly beneficial for young children who might have to go to bed before the official pumpkin lighting at dark each day. Other people choose, instead of carving their pumpkins, to paint them. Painted pumpkins can be made to reflect favorite characters, display a young child’s artistic talents, or anything else that the artist desires. This is also a popular activity for Halloween parties and other gatherings with multiple children. Pumpkin decorating during the Halloween season is a rich tradition well worth the time and effort that many people put into it. These works of art may be temporary, but their memory will live on for years to come.